Anstruther is a well known fishing port on the south facing coast of the East Neuk of Fife. Very popular with visitors, its harbour remains busy with pleasure craft. 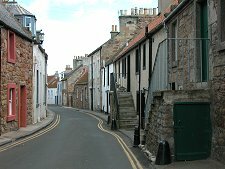 But how many visitors to Anstruther have even heard of Cellardyke, now effectively part of the same settlement? 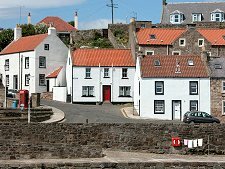 And of those who have heard of it, how many would guess that at one point Cellardyke's harbour, only half a mile east of Anstruther's, made it the second most important fishing port in Scotland? 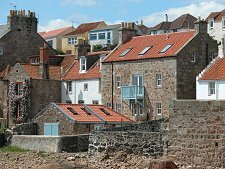 You can read the full text of the chapter about Cellardyke in D Hay Fleming's 1886 book: Guide to the East Neuk of Fife. Cellardyke is a hidden treasure. Its harbour doesn't benefit from the direction signs that elsewhere in Fife tell you you're in danger of missing something worth seeing. 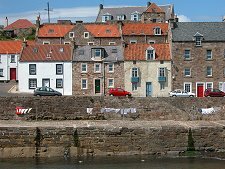 And from the main coast road, the old heart of Cellardyke is screened by a veil of housing that simply looks like the outer edge of Anstruther. 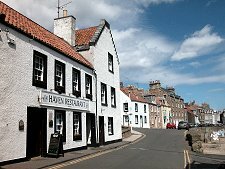 Even from Anstruther itself, it takes persistence to stick closely to the coast as you progress north east beyond Anstruther Harbour and penetrate the narrow streets that guard Cellardyke Harbour from the landward side. But the effort is worth it. Cellardyke Harbour, still marked on maps as Skinfast Haven, may not be home to many boats, fishing or otherwise, these days. But in every other respect it is one of the best preserved and most attractive old fishing ports in Scotland. 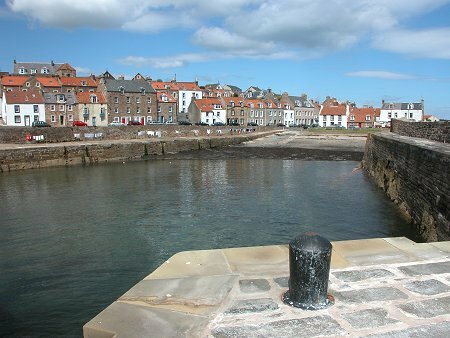 The harbour itself does not quite equal Crail's in terms of simple chocolate-box lid appeal. 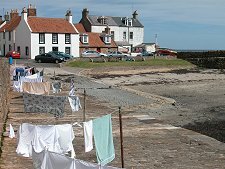 But catch it on a day when the village's washing is hanging out to dry on the harbourside and you get a sense of a gritty realism long gone from Crail. And Cellardyke's attractions are not confined to the harbour. The streets running south west from it, George Street and John Street, are crowded closely on both sides by cottages and houses, with those on their south east sides backing directly onto the foreshore. The effect is very like Stromness, but more so: or like the "unimproved" sections of Lerwick's waterfront. Until the 1500s the settlement here was known as Nether, or Lower, Kilrenny and the harbour as Skinfast Haven, a name that still appears on modern maps. The name Cellardyke had its origins in "Sil'erdykes", which came from the shine of the herring scale in nets hung over walls (or dykes) to dry in the sun. Local residents became known as Dykers. In the 1880s, over 200 fishing boats were based here. But a storm in 1898 damaged the harbour and the fleet moved half a mile down the coast to the relatively new and better protected harbour at Anstruther, starting the process of decline that has led to an almost empty harbour and the virtual disappearance of Cellardyke's identity under the subsequent expansion of Anstruther.